Before we start looking at the various Green Lanterns that populate DC's comics (yes, there is more than one), let's run down a few terms that will come in handy. 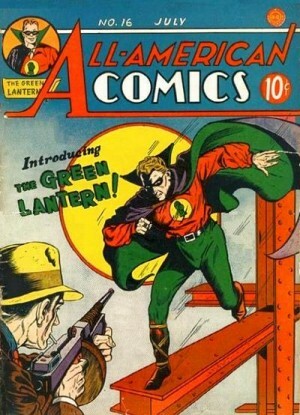 The Golden Age: Short for "the golden age of superhero comics", generally considered to begin with the first appearance of Superman in 1938 and ending sometime in the late 40s/early 50s as horror, sci-fi, Westerns and romance comics supplanted superheroes as the best selling type of comics. Inspired by the pulps, superheroes from this era generally drew their powers from mystical sources or were just old fashioned brawlers with cool gadgets. The Silver Age: An era which saw the return of superheroes to popularity, so much so that they became (and remain) the dominate genre within American comic books. 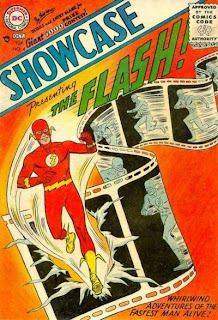 Considered to have begun with the first appearance of the Flash in DC's Showcase #4 in 1956. However, this Flash was the second character at DC to have that name and be able to run really fast; editor Julius Schwartz came up with the idea of reviving DC's old Golden Age characters with new costumes, secret identities and a more science fiction bent to their powers. 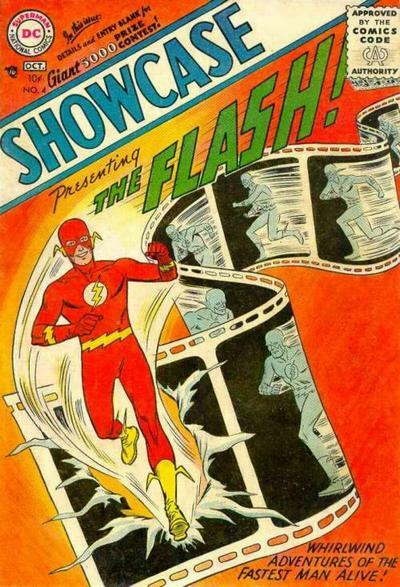 Thus, before long, DC was publishing new versions of its Golden Age heroes like Flash, Hawkman, and Green Lantern. Earth 2/The Multiverse: It wasn't too long before Flash writer Gardner Fox decided to have the Silver Age Flash meet the original. At the time, the Golden Age heroes cited by their Silver Age successors as inspiration, the Silver Age characters as kids having read the adventures of the Golden Age characters. 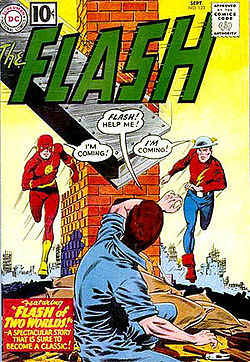 So Fox wrote a story in which Flash traveled to a world where the Golden Age Flash existed and was still doing his thing; Fox called that world Earth 2, and the DC Multiverse, the collective name for all the myriad alternate Earths which soon popped up (like the world where the Nazis won WWII, or the one with evil counterparts to the heroes), was born. 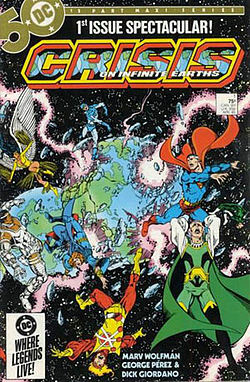 Post-Crisis: By the early 80s, DC had decided (whether rightly or wrongly is still debated) that their Multiverse was too unwieldy and off-putting to new readers, and they used Marv Wolfman and George Perez's Crisis on Infinite Earths twelve issue series to clean house, wiping out the Multiverse and merging elements of the various Earths into one combined universe. Thus, the various Golden Age/Silver Age heroes now existed on the same planet in the same reality, with the idea being that the Golden Age heroes were first active in World War II, with their Silver Age counterparts coming along later. Nu52: DC would continue to tinker with the fabric of its fictional universe after Crisis, using line-wide events like Zero Hour, Infinite Crisis and Final Crisis to tweak characters' backgrounds and relationships and (in theory) keep things fresh and easy to follow for new readers. However, few of these series committed to the kind of sweeping changes they promised, and generally made things more complicated than ever. 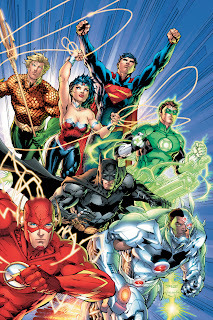 Then last September, spinning out of its Flashpoint event, DC cleaned house in a way that eclipsed even the original Crisis by cancelling all their existing titles and relaunching their entire line with fifty-two new #1 issues featuring their old characters with (to varying degrees) new origins, costumes, relationships, etc. 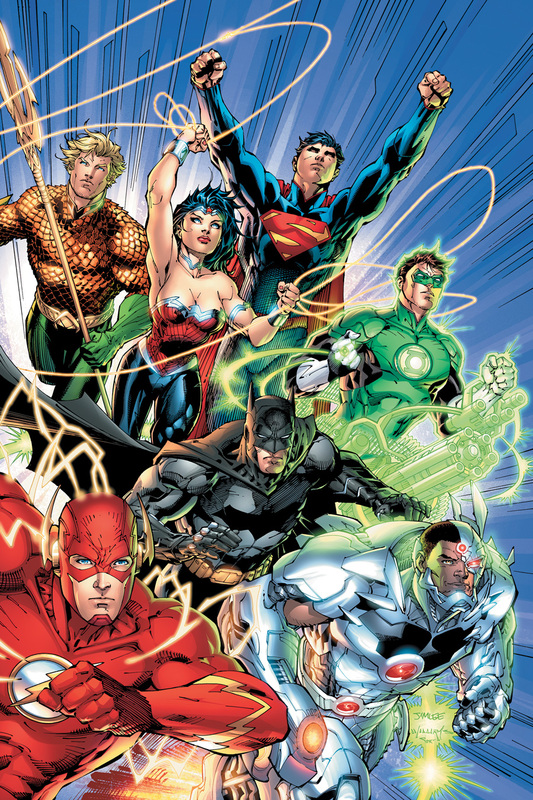 The collective (and somewhat derisive) name given to this new universe of DC characters by some fans is "Nu52". So that (finally) brings us to the Green Lanterns. 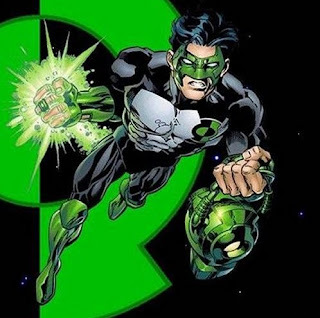 Here, then, is a rundown of all the various characters to be called Green Lantern. The original Golden Age Green Lantern, who debuted in 1940, Alan Scott was a railroad engineer who discovered a flaming green lantern forged from a meteorite which crashed to Earth centuries ago. The lantern explains to Alan how to fashion a ring from its metal that will allow him to tap into its power to fight crime, though it was useless against wood. 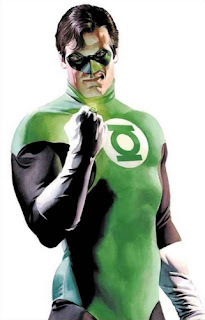 This Green Lantern went on to help form the Justice Society of America, the predecessor to the more well-known Justice League, and post-Crisis, was considered one of the superhero community's elder statesmen, who helped mentor younger heroes. He even fathered two children along the way, who grew up to be superheroes themselves. 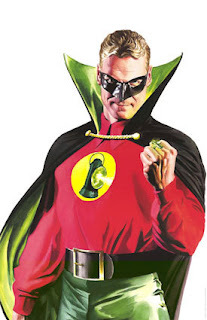 Though he has a publishing history that stretches (almost continuously) back to the forties, Alan Scott has most definitely been eclipsed by his Silver Age successor, having never headlined a book titled "Green Lantern" since his original series was cancelled. However, it is this version of Green Lantern who was recently revealed to be gay in the Nu52, once again residing on Earth-2, independent of the other Green Lanterns, and for once, is the Green Lantern everyone is talking about. The Silver Age Green Lantern, you can read more about him here. This is the version of the character with which most non-comic book readers are familiar, as he was featured on Super Friends and played by Ryan Reynolds in the live action movie. In accordance with the sci-fi influences of the Silver Age, this version of the character was re-imagined as a member of the intergalactic Green Lantern Corps, a group of space cops gathered by the Guardians who use their green power rings, charged by their green lanterns, to channel their willpower into fantastic energy constructs. 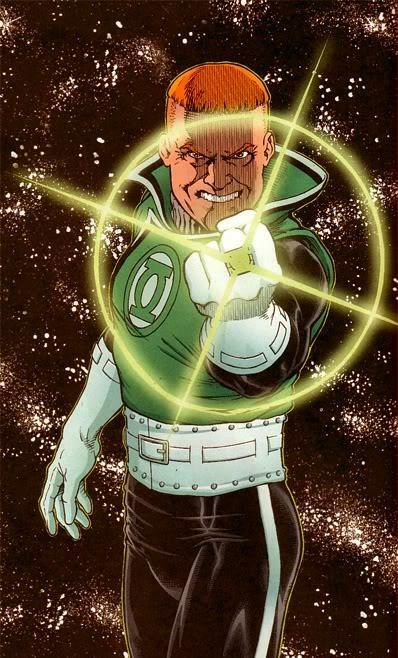 He received his ring when it selected him as the nearest worthy successor following the death of Abin Sur, the previous Green Lantern of the space sector in which Earth resides, and is considered to be the first Green Lantern from Earth (though not the last, as we'll see), a condition which technically remains true, as Alan Scott derived his powers from a different source and was never a member of the Green Lantern Corps. 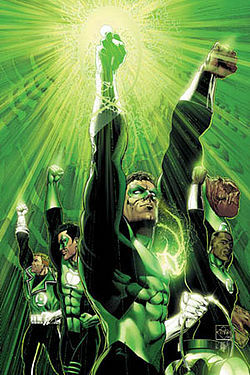 Because the various Green Lantern titles were some of DC's best-selling prior to their relaunch last September, in the Nu52 universe very little has changed regarding Hal, though he now fights alongside his one-time mentor and longtime foe Sinestro, who has once again been appointed a Green Lantern. 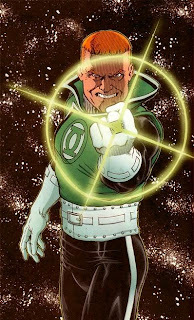 Debuting in 1968, Guy Gardner began his career as the first of Hal Jordan's "backup" Green Lanterns. It was revealed that when Hal's ring chose him to replace Abin Sur, it did so only because he was the closest of two worthy candidates; Gardner was the other candidate, and thus designated Hal's backup should anything happen to him. As these things go, it wasn't long before Gardner was slinging a ring of his own (as well as his distinctive bowl cut), and post-Crisis, he developed a brash, arrogant personality and gained fame as the resident Green Lantern of the acclaimed Giffen/De Matteis Justice League comic. 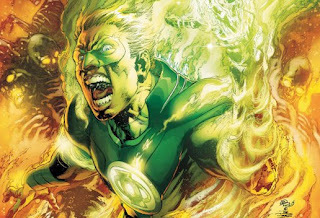 An architect and former Marine, John was originally introduced as Hal's new backup, following a period in which Guy Gardner was briefly incapacitated. When Hal stepped down for a time, Stewart replaced him as Earth's full time Green Lantern (Gardner was incapacitated again, this time in a coma). 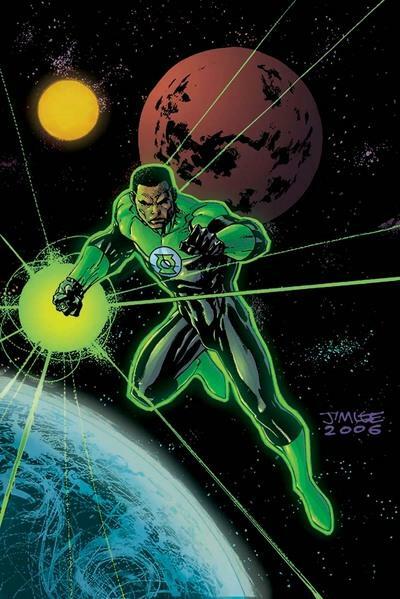 He has remained an active Green Lantern ever since, even after Hal returned, with his military background often used to distinguish him from his fellow Lanterns from Earth. John was also the Green Lantern featured in the Bruce Timm/Paul Dini Justice League cartoon. In the late 80s/early 90s, one of the trends within superhero comics was to replace longstanding characters with new and hipper (and often times darker) counterparts, the better to appeal to new readers and reinvigorate concepts with twenty plus years of history. Thus, we got The Death of Superman, and that character's short term replacement by, amongst others, a cyborg and a "kewl" teenage clone, and Knightfall, in which Batman is replaced by an edgier character wearing high-tech armor (while these changes were often mandated by editorial and/or the marketing the departments, the writers often used these edicts as a way to explore just how important the classic and "old-fashioned" versions of these characters were). So when it was decided to give Green Lantern this treatment, Hal was driven insane following the destruction of his home city (and later revealed to be possessed by an evil entity) and went on a rampage that resulted in the death or depowerment of all Green Lanterns including, eventually, Hal himself. One power ring escaped Hal's purge, and it made its way to artist Kyle Rayner, who went on to become Green Lantern for most of the 90s, including a time as the featured Green Lantern of Grant Morrison's seminal JLA run. As "replace the hero with a hipper alternative" stories go, Kyle's was one of the better ones, as he was presented as a raw, unsure hero learning the ropes, cutoff from the vast resources of the Green Lantern Corps, and trying to live up to the legacy of his predecessors (the death of his girlfriend at the hands of one of his villains also coined the term "Women in Refrigerators", used to describe/criticize the trend of killing female characters only to evoke a reaction from male characters). Of course, as it goes in comics, Hal was eventually resurrected and exonerated, the Green Lantern Corps came back, and Kyle soon joined John and Guy as Earth's extra Green Lanterns. So that's the 101 on Green Lanterns, which turned out to be a much longer way of saying "no, the Green Lantern who's gay isn't the same as the one played by Ryan Reynolds" than I was expecting. But that's one of the things I love about comics! But Marvel still wins in that Northstar was always gay and now he's marrying his long-time boyfriend. In their defense, they've only made big, sweeping changes twice. Everything else was relatively minor, detail-orientated stuff (though of course, you could quibble with the fact that all those minor reality-altering events were marketed as being BIG reality-altering events before it became clear they weren't, but that's a whole 'nother beef). To be clear, Northstar hasn't always been gay - the character didn't come out until the early 90s, but yeah, he's been gay for awhile. And his longtime boyfriend has, as far as I know, only been around for maybe three years, real world time, and it isn't like Northstar got the spotlight all that often in those three years. I thought your walk through Crisis and multiverse was very succinct and straightforward! it's certianly the clearest way i've read it explained, being as that i didn't get into DC until Morrison's JLA run. The clue was there from the very beginning and none of us ever saw it! Regarding Northstar, I should point out that he was pretty much always "openly" closeted... not in his earliest X-Men apperances, but if you read Byrne's Alpha Flight, it's pretty clear from the very beginning that he's gay. @Sarah: it's certianly the clearest way i've read it explained, being as that i didn't get into DC until Morrison's JLA run. Thanks! Finding the right balance between "concise" and "informative" was tricky; as it is, I still feel like it went on too long, but I couldn't trim much else and still make sense. @Matt: The clue was there from the very beginning and none of us ever saw it! if you read Byrne's Alpha Flight, it's pretty clear from the very beginning that he's gay. Yeah, it's definitely a case of, when he does come out of the closet, you go, "that makes sense" instead of "huh?". Not to pile on, but again, DC's defense, they did have gay characters prior to this. In fact, the motivation to make Alan Scott gay in the Nu52 came from the fact that in the previous continuity, his son, Obsidian, was gay. So the writer of Earth 2, the comic in which Alan Scott is now appearing, felt that, since the characters had been re-imagined such that he was younger and didn't have any grown children, by making Alan Scott gay it balanced out the lack of Obsidian in the Nu52 universe. That said, while DC has had homosexual characters prior to this, Alan Scott is certainly the most high profile homosexual character DC has ever featured. But it isn't like Northstar is exactly A-list, either. If anything, the best homosexual characters Marvel has at this point are Hulking and Wiccan in Young Avengers, even though Marvel has a dickens of time keeping an ongoing YA series on the shelves for some reason.